The Muddy Waters of Swamplandia! Kiwi was shocked to see how beautiful his home was. This beauty was a secret that the trees had been keeping — the islands looked so different from this altitude. Shining green, shining blue. The sun webbed the mangrove jungle in inky red. Where was Swamplandia!? Kiwi wondered. Distance turned all the tree islands into identical green teardrop shapes — at this altitude you could see how the current's hand had shaped them. You could also see the melaleuca stands, which looked like mildew on bread, gray trees grouped so thickly there was not a breath between them. 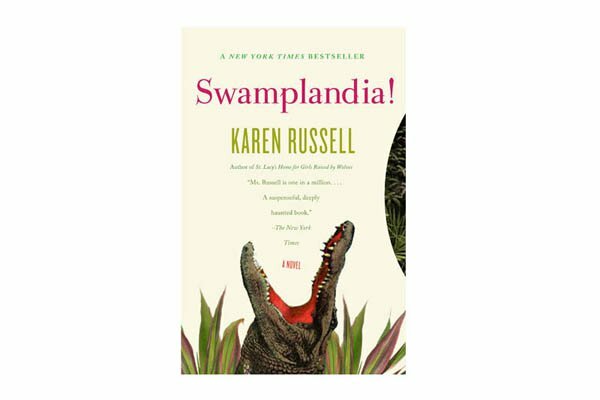 In her debut novel, Swamplandia!, author Karen Russell tells the story of the Bigtree family's failing alligator theme park. But the clincher for us is the book's unusual setting, deep in the heart of Florida's Everglades. It's a fantastically murky folktale, where Ten Thousand Islands and ten-foot high grasses star alongside dilapidated barges, birds, and a labyrinth of trees. Russell explains, "This story is very close to me — the landscape is a fictionalized version of my home, 'mainland' South Florida, and the shrinking Everglades (about an hour from Miami), a terrain that has been poisoned by phosphorus pollution, dammed, drained, paved-over by developers, covered in sugarcane, and dyked. It's only twenty percent of its original size, and it's disappearing at sickening speeds." Russell's vivid descriptions of haunting swamp creatures in an insular world feel like insights into something much bigger than all of us. "For me, the story of the Bigtree family's meteoric descent after their mother's death has always been connected to this larger story of the imperiled Everglades cut off from its headwaters. But even after all the damage we've done, the Everglades remains one of the most indescribably beautiful and diverse ecosystems in the world, where just a few inches of elevation will change the landscape entirely — you can travel from the alligator-haunted waters of the eerie sawgrass prairies to cypress domes to the blue waters and mangrove jungles on the Gulf side."